We always have a handpan for you and we never make a waiting list. 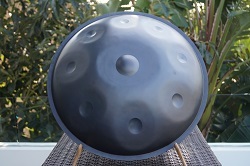 You can always purchase our handpan through our website. We are always here to assist you by chat, email or phone. Each Tzevaot has its very own serial number – Tuned to perfection. About Our Tuner: David Parkin has been tuning every Tzevaot since the company started in 2012. He has over 20 years experience tuning steel drums. He has been re-tuning the original Hang® since 2003. About Our Origin: Tezevaot has shipped instruments all around the world. Co-founders Elias Amkie and Teddy Amkie are always looking on how to improve the sound and the quality. Musicians and new players contact us every day to find out more information about our handpan and to purchase one. Everyone is invited to come play with our instruments at your leisure. About Our Industry: Tzevaot is being sold in major retailers domestic and worldwide. Availability: Located in the heart of Los Angeles, California, we are always available to speak with you at your convenience.